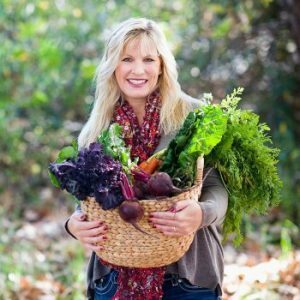 I mentioned in my last post that I’m often inspired by recipes as I plow through magazines while working out at the gym. 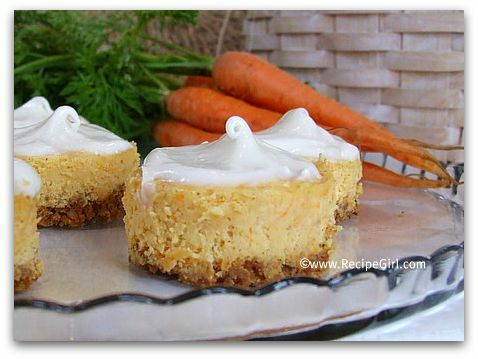 Martha had a recipe for Carrot Cheesecake in her latest issue of MS Living and that got me thinking. I do love carrot cake, and cheesecake is pretty much my all-time favorite dessert… so why not combine the two? That same day I went clothes shopping and came home with mini-cheesecake pans instead. My idea was now complete: Mini Carrot Cake Cheesecakes with Cream Cheese Icing. Mini-cheesecakes are made the same way as regular cheesecakes… crust baked first, then filled and baked again. This crust was made of graham cracker crumbs and toasted pecans. I know that cheesecakes don’t typically have an icing on top, but I remembered the Red Velvet Cheesecake that I made last Christmas (and how good that was). Since carrot cake most often has a cream cheese icing, I felt these mini cheesecakes needed some too. 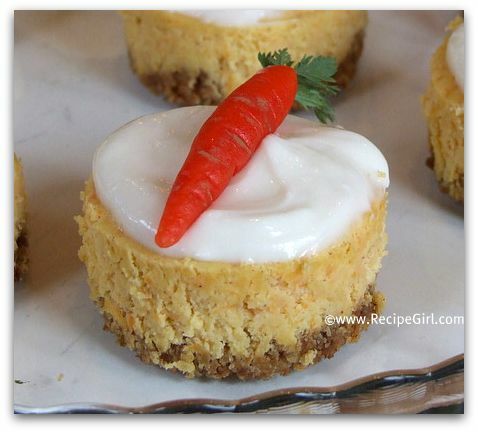 I topped the mini cheesecakes with Petite Marzipan Carrots. Stick a small mint leaf on there if you don’t feel like making the carrots (or leave them plain). The best part about the marzipan carrots though is that you can actually eat them! I was really quite happy with how this dessert turned out. They’re cute little treats, and those marzipan carrots really make them perfect for Easter. If you’re preparing these for Easter, it’s best to make the cheesecakes the day before, then ice and decorate the day you plan to serve them. 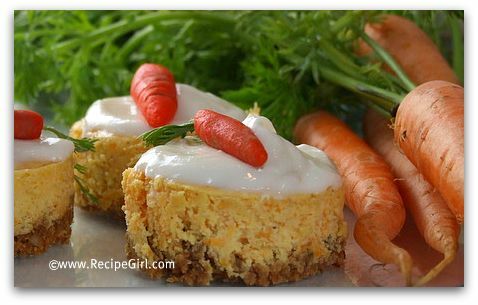 When I first spotted this recipe, I thought carrots in cheesecake sounded a little strange. I grated the carrots finely so there weren’t big chunks of carrot in there. It wasn’t at all strange. 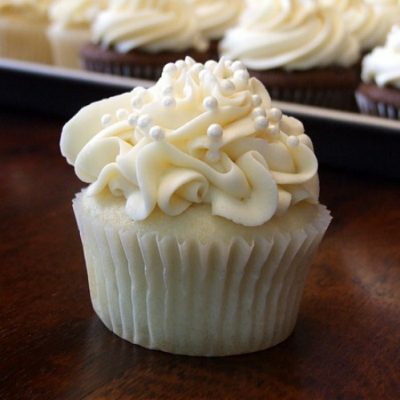 And the cream cheese icing… well, lets just say that you shouldn’t leave it off! These cheesecakes were beyond YUMMY. 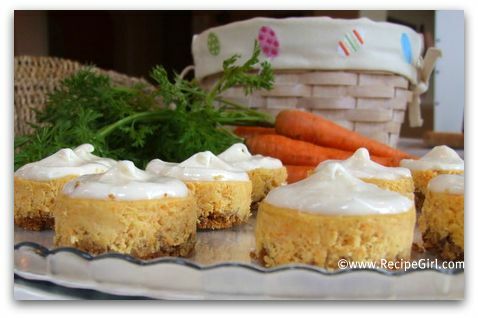 This recipe can be found here: Mini Carrot Cake Cheesecakes. Creamy Gruyere & Shrimp Pasta (or) "A Dinner Your Family Will Love You For"
Can’t wait to try these. A combination of two of my favorite deserts, and I love that they’re mini. So cute. Can I bake these in foil muffin liners? Can I make ahead and freeze for a graduation. @avis Heithoff, Foil muffin liners shouldn’t be a problem, but I can’t really give you an answer on the freezing. If I were you, I’d test out the recipe as you’d like to use it before the graduation… just to be safe. Good luck! 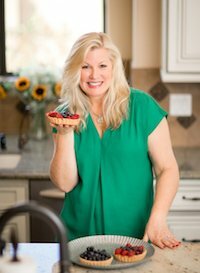 I love anything mini – especially cheesecakes! Those wee carrots are too cute…aren’t you crafty these days! PS. Carrot cake is one of my faves. Carrot cake cheesecake sounds so good! Looks delicious and your marzipan carrots are too cute sitting on top. I love it. You inspired me to do marzipan again. I thought it might be a fun project with the kids. But unfortunately it was much harder than I remembered and hard for them to make Easter egg shapes even. Oh well. We had fun for a bit. 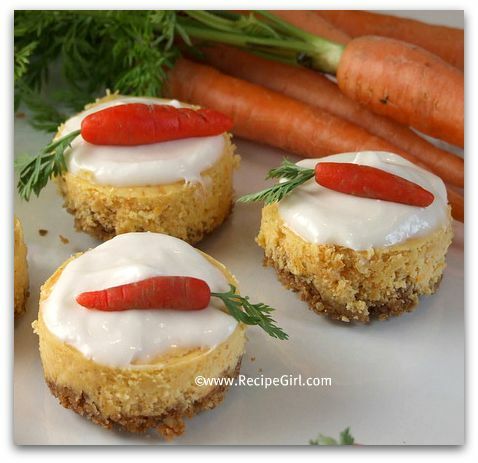 Great use of the marzipan carrots! Carrot cake cheesecake sounds delicious. I thought the carrots were real! Those are amazing! Carrot cake + cheesecake = so good. That is a lovely, lovely dessert! It’s unfortunate for me that the better half is not real big on carrot cake. The marzipan carrots look really great. I recently made some marzipan from scratch and have been looking to put them to a use other than eating a bite of it every time I open my fridge! Yummy – my two favorites. 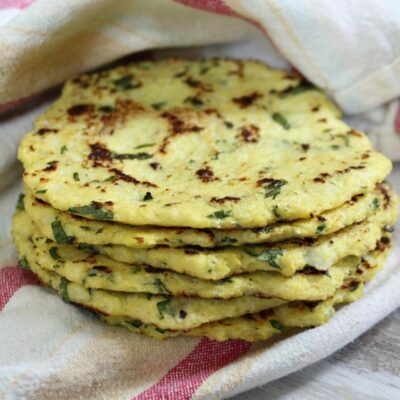 So I’m assuming that I could make this recipe in an 8″ spring form pan? Or is it best to use the little mini cheesecake pans? I halved Martha’s original recipe to make these mini cheesecakes. If you wanted to make a full sized cheesecake, you would need to double everything. Oh wow, those came out so cute and they look insanely delicious! 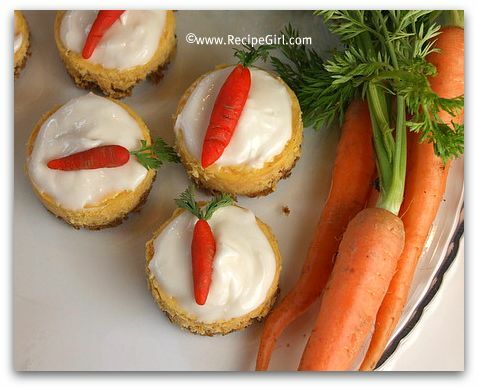 Ahhh I adore the mini cheesecakes and those carrots are just soooo cute!